The artist lets us participate in his spiritual explorations. He shows us the beauty of every single thing. His works are rich with symbolism: the tree connects the earth and the sky, it grows its roots into the material world and raises its leaves toward the divine. The butterflies fly away and carry our prayers with them; they symbolize the liberation of the soul, the distancing, the road towards our internal lights. Each painting is a moment of enchantment, a piece of happiness that comes back every time when you set your eyes upon the picture. We thank Valery Tsenov for presenting us with his own moments of clarity and beauty that remain vital in our tumultuous and complicated world. 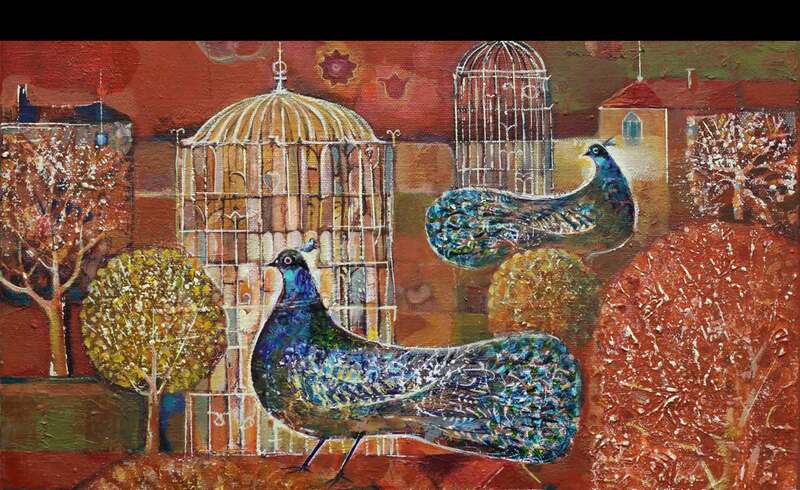 Painting, just like music, takes us into the wonderful world of dreams and joy. As far as techniques are concerned, this young artist is a true virtuoso. He is equally good at using oil, gouache, water colors, pencil, quill etc. And because technique is not an obstacle for him to overcome, he is able to let his imagination run wild and give form to his fantasies in the most precise ways. Some parts of his paintings are almost transparent, others are definitely standing out in relief; in each painting the harmony of colors is expressed in endless nuances, with a bottomless richness of movement and incomparable light. 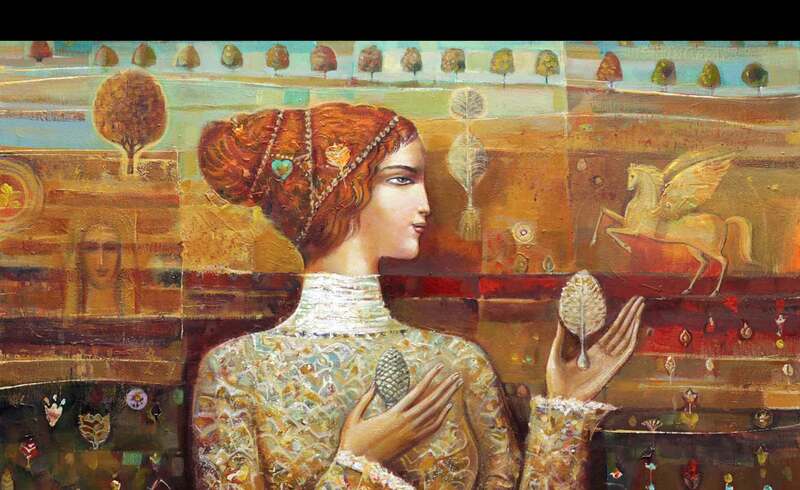 Valeri Tsenov is beyond all doubt one of the "great artists". May God grand him a long life and may he continue to charm us and decorate our life and homes with his wonderful paintings. To turn a vision into artistry, Valeri Tsenov uses two basic approaches – sign symbolism and ritualism. Both are reliable and time – proven approaches, through which "a man stays in his own house when he's on the road and moves along the road while staying in his own house". And that road leads to the magical borderline between Things. (If it ever existed). It leads to the reality for which we might choose different words to name, which we rarely comment upon, but which is at the very basis of our intimate views. That reality, called Imagination, that slowly trickles out of the child to leave it in the hands of old age, and thus in the hands of oblivion. 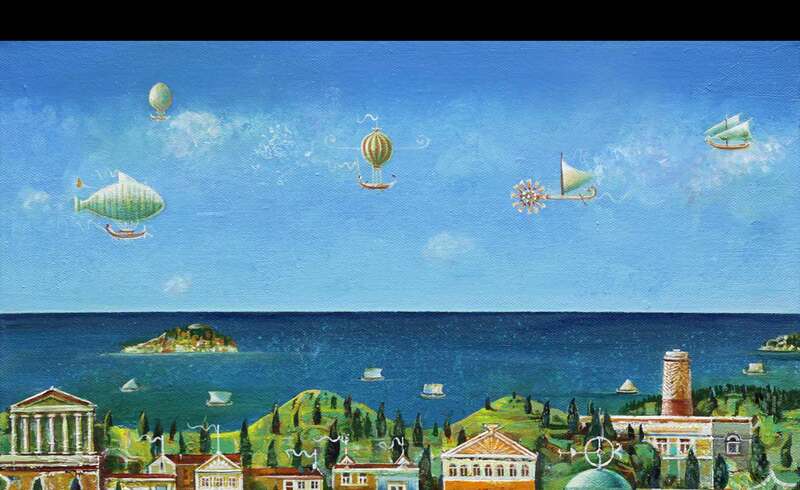 Valeri Tsenov uses cleanly and paraphrases the Classical symbols; his aim is to break the balance of everyday existence, to free the conventions of their `police job` and, finally, to build the "ideal planet" where man is really a part of nature. The figures of a man or a woman, a bird or a fish, a flower or a tree…- have the symbolic character and stand above the mere knowledge of them, by which they suggest a primal and all- embracing attitude to the world. This is the source of the emphasized non- temporality and rituality in the artist's compositions. The ritual- as a basic, sacred approach of expression; the ritual- as a sacred mingling of spirit and matter. The role of the detail is to be especially noted- it serves as guide in the labyrinth of messages, as support in a world where its substantial side is the last thing to come to mind. His own flexible expression combined with the characteristic pattern and almost philosophical gaze into the world define the artistic image of the Valeri Tsenov. Valeri Tsenov's artistic presence is marked by the signs of active internal suspense in the seeking and presentiment of the secrets in human and natural existence. This knowledge of seeking the hidden meaning enables his works to be seen as the result of prior spiritual and mental journeys. The overall impression left by his paintings is one of a dynamic, multi- layered, polisemantic phenomenon. Dynamist is born in the sincere enquiry and exploration of the interrelations between the visible and invisible worlds, between the known and the secret, between the touchable and the untouchable. The multiple layers, taken as a problem of form and polisemantics related to the contents, are mutually connected. These canvases illustrate the harmonization of thought and medium, theme and composition, image and overall structure. They carry the signs of form and imagery modeled by thought. In this respect the mull layers are not just a technical approach, they are also a key to the author's aesthetic and philosophical disposition. The combination of Christian Orthodox icon style in painting a woman`s face and the apparent primitivity surrounding it are just one of the cases of harmonizing the opposites. The idea of mutual complementation and rationalization of the fine and the crude is an essential part of the open rhythm of life. To Valeri Tsenov, reaching the depths of human identity is only possible along the lines of exploration of the hidden – laid layer upon layer for centuries – interrelations between things. In this respect his works are a modern – day empathy to eternal human values with the accent put not upon convincing answers, but on exploring and presentiment of the possible depths. Presentiment that functions as a bridge between the personal knowledge and the collective human wisdom. The combination is achieved through the expressive possibilities of the symbol (fish, seed, key – hole, tree, bird, woman etc) which sets the guidelines towards spiritual journeys. Thus in the role of all – organizing element comes not only the readiness to modernize symbols, but also the strife towards exploring the mysteries of life through their artistic re – creation. The refusal to use flashy forms is also an invitation to saunter into the world of deep symbolism of love, beauty and miracle. Stepping into these spheres is beyond the 'here – and – now'; it goes beyond while at the same time containing the separate civilizational layers, and the insight reached through that sort of meditative disposition in fact return the meaning of human life and provoke humbleness before the universal harmony.